Hawthorne established the form of the American short story, drawing on the deep and often tortured psyche of his fellow New Englanders. 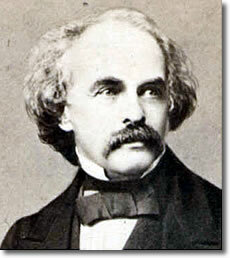 Born in Salem MA, Nathaniel Hawthorne (1804-1864), was the son of a ship captain who left his mother a widow. Hawthorne graduated from Bowdoin College in 1825 (along with poet Henry Wadsworth Longfellow), and spent the next 12 years at home writing. His early stories were collected and published as Twice-Told Tales in 1837 and 1842. This supported him at a below-subsistence level, so he found a job at the Boston customs house, but soon quit. He moved to Brook Farm, the idealistic community of the Transcendentalists, but was not suited for that either. In 1842 he married Sophia Peabody and moved into the Old Manse in Concord MA. His new wife was a member of Ralph Waldo Emerson's circle, which included Henry David Thoreau and Margaret Fuller. He wrote Mosses from an Old Manse (1846) here, then moved back to his native Salem and served as surveyor of the port while working on his most famous novel, The Scarlet Letter (1850). This and his next book, The House of the Seven Gables (1851), examine the dark psychology of Puritan New England. He then moved to Tanglewood in the Berkshire hills of Massachusetts to write A Wonder Book (1852) and Tanglewood Tales (1853), where he got to know fellow novelist Herman Melville, but moved back to Concord to complete The Blithedale Romance (1852) which drew on his experiences at Brook Farm. Back in Concord, he bought the former Alcott home, Hillside, renamed it The Wayside, moved in and looked upon it as his home until his death in 1864. The Wayside, Concord, the Hawthornes' home for years. He wrote a campaign biography of Franklin Pierce, a friend from Bowdoin, and when Pierce was elected president of the United States, he repaid Hawthorne with the post of American consul at Liverpool, England (1853-1857). Several travel articles from this time were published in 1863 as Our Old Home. His last novel, The Marble Faun, appeared in 1860. He died in 1864 while on a trip in New Hampshire's White Mountains with Franklin Pierce. Hawthorne, his wife Sophia and their daughter Oona are buried on Author's Ridge in Sleepy Hollow Cemetery, Concord, Massachusetts. 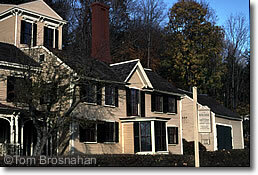 While in Concord, visit also The Hawthornes' homes, the Old Manse and The Wayside.